The term Nujazz or nu jazz is a mixture of jazz and contemporary electronic music. Emerging in the late 1990's Nujazz blends jazz elements with other musical styles, such as funk, soul, electronic music, and free improvisation. The new album release is Ragbag (2018). Thomas Siffling performs on this album trumpet and flugelhorn, Maxim Illion keys, bass and programming. Further musicians are Karlos Boes (saxes, flutes), Roman Babik (piano), Peter Hantke (keys, bass & programming), and Detlef Hoeller (guitar, keys & programming). The first track is prophetically called This Is What You Want. Based on a dynamic oriental-style beat trumpet player Thomas Siffling develops his own idea of dreamland. Ragbag is another name for a colorful hodgepodge. This acoustic Ratatouille mixes elements of Latin beat, Reggae and other farrago. Tequila is a 1958 Latin-flavored rock and roll instrumental written by saxophonist Daniel Flores and recorded by the Champs. Siffling transfers the excitement of this stunning hit to our modern time. What we oldies miss is the shout out Tequila!. Beyond the Window allures with an innovative sound aesthetic in film-noir-like quality. Jumping The Shark infects the listeners with a great rhythm potential and an embracing melody. Kinda Small Talk put everything in the balance for optimized listening pleasure. Some of That Jazz for your soul, your mind, your heart. What sounds like a promotional jingle for the genre jazz quickly develops a life of its own. Boogaloo or bugalú is a genre of Latin music and dance which was popular in the United States, especially in the NY area in the 1960s. Boogaloo Bebop is Club Des Belugas' tribute to this great time of music and fun including musical quotes for the insiders. Sofa Clubbing combines a deep unbinding love for Latin percussion with the cool sound of Siffling's trumpet. Flyby is written under the motto, respect the melody and rhythm. Similarities to Michael Jackson's Beat It are recognizable. Upper Valley features a splendid duet between wah-wah-guitar and Siffling's elegant trumpet. We Owe You One dives into the rhythm world of Latin jazz music. On Lil Fizz the group develops deep black melancholy and contemplation to an acoustic art form. 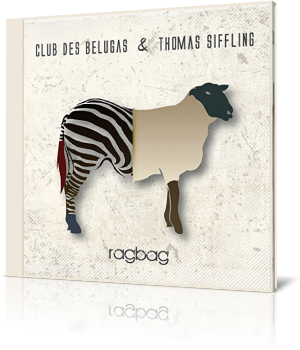 Club Des Belugas & Thomas Siffling give the genre nu-jazz a high-quality face. Ragbag bristles with musical ideas and energy.